Bald Rock Canyon is a legend in California whitewater history, and exaggerated stories of its challenges abound. Reading the first descent account in Holbeck and Stanleys "Best White Water in California" is enough to set any first time descenders nerves on edge. The dam builders have claimed the North Fork and the South Fork but the Middle Fork remains a wild river all the way down to Oroville Reservoir where the three forks of the Feather come together. The MF Feather was one of the charter rivers designated Wild and Scenic after the enactment of the policy . The entire Middle Fork downstream from the confluence of its tributary streams one kilometer south of Beckwourth is protected under the act, broken down as: Wild — 32.9 miles; Scenic — 9.7 miles; Recreational — 35.0 miles; Total — 77.6 miles. The Bald Rock Canyon run is a true classic with outstanding scenery and a nice mix of beautiful slides and drops through a Sierra granite landscape. Come prepared for tough rapids and/or grueling portages. Depending on your skills and the the pace you want to set this run can be done as a long day trip or an overnight. The run ends on the reservoir so you'll need to have a plan for what you'll do when you hit the flatwater. AW recently signed a Settlement Agreement for the Oroville Hydroelectric project that includes development of a formal shuttle service for whitewater paddlers. Initially the run eases into the swing of things with moderate rapids and great scenery. Soon bedrock becomes more apparent, both in the stream and in the valley walls and rapids increase in difficulty and eventually the valley and river bed become one, forming a giant U shaped granite channel hundreds of feet deep with perfect bedrock ledge drops and green water. Giant midstream boulders announce the imminence of Atom Bomb Falls famous portage, and hard rapids continue to the lip. At moderate flows, the rock climbing gymnastics and rope work of the first descenders is unneeded and the ferry can be started on the right shore with ease, made easier these days by a root ball partially blocking on of the deadly syphons this rapid is famous for. Nevertheless, an inappropriately high flow would make this ferry once again death defying. An alternate line exists to run the first tier of Atom bomb by smearing a boof on the extreme left against the granite slabs but care should be taken before committing to this route. Once the opposite shore is attained, portaging is easy along flat bedrock shelfs to an overlook of the river now 40 feet below. This is the legendary Bald Rock campsite, home to both wild parties and nights of solitude and beauty surrounded by smooth white granite. A little team work allows boats to be lowered down ledges to water level. Difficult and congested class V rapids continue now, many of which pose extremely challenging route finding and occasional dead end syphons and sieves through giant round granite boulders and some portaging and creative route finding will be needed. A quite obvious river wide horizon line and dull roar announces something big, in this case Curtain Falls, a 30' clean river wide waterfall. The falls can be scouted easily to the left, a good position also for video and photography. The classic line is to follow "The question mark", a visible line in the smooth granite bedrock forming the lip of the drop that can be clearly seen through the crystal clear smooth flowing water, and which leads you faithfully over the gradual roll off of the huge ledge. Below a long low angled slide, Super Slide, accelerates water into a large sticky hole but this can be easily avoided by driving up onto the slabs on the far left. The large pool below this leads in to Three Doors, one of the largest rapids of the run which has a fierce hole halfway through which at some flows can be cheated on the left around a low angled slab. Sieves wait below for a beaten and unlucky swimmer so good safety needs to be set here, and the last drop forms another notoriously sticky hole against the right wall which could once be cheated left, but as of April 2007 the cheat is reported gone. This rapid is best portaged left against the cliff face rather than at water level. Soon after perhaps the largest rapid of the run, Four Deaths is reached. This rapid, named allegedly after Lars Holbeck claimed to see 4 separate places where you could die in it, is long and burly with shallow rock lurking in many places. It finishes with accelerating water down a low angle slab towards a remarkable tubing standing wave feature caused by a right side boulder and then ends abruptly with a large fearsome looking hole. Some people seal launch in on the right running only the second half of the rapid, others ferry right after scouting left and portage the whole affair. Eventually difficulties relent and rapids start to become boat scoutable IV+ affairs until the river suddenly drops into the lake. Wealthy boaters can choose a cush ride out by pre-hiring a boat and finding a willing shuttle bunny to meet them here. More resourceful ones will scam passing boaters for a ride out. Only the most zealous will contemplate the 12 mile paddle out to the first legal public takeout with road access. Locals may have other stealthier shuttle routes. Note also the afore mentioned AWA /PG&E shuttle service hopefully soon to be arranged to ease this problem. Atom Bomb Falls is the source of much fear and intimidation amongst first timers on Bald Rock. The story of the original first descent portage in Holbeck and Stanley's guide provide no reassurances what so ever. The reality is somewhat different these days, and, provided moderate flows the portage and "death ferry" provide no really obstacle to these qualified to paddled this run. Large rapids amongst even larger boulders are a sign of the approaching portage and a pool is exited to the right shore so that boats can be carried around the first tier of the drop and the ferry begun. The ferry is relatively undramatic (<1000cfs) and the eddy to catch on the far shore better than historically reported. The portage then continues easily along the left hand shore along bedrock until boats can be lowered down ledges to the river again. Some paddlers have found a line to paddle the first tier hard left, smearing the bedrock slab with a large boof. Work the logistics of this one out for yourself if you fancy your chances. Curtain Falls is a super clean 30' river wide granite ledge waterfall. The generally accepted standard line is to start right of a midstream boulder following a feature visible in the submerged bedrock called "The question mark" (due to its shape). This leads you faithfully over the blind roll off of the ledge to a hopefully safe landing. In general the current tries to move you left harder than expected and slight right boat angle is needed to nail the ideal line which falls off the right side of the smooth central tongue with a pencil or late boof, your back!, your choice!. A long low angled slide, Super Slide, accelerates water into a large sticky hole but this can be easily avoided by driving up onto the slabs on the far left. Three Doors, one of the largest rapids of the run has a fierce hole halfway through which at some flows can be cheated on the left around a low angled slab. and a second fierce hole at the very end. Sieves wait below the first hole for a beaten and unlucky swimmer so good safety needs to be set here, and the last drop forms a notoriously sticky hole against the right wall which could once be cheated left, but as of April 2007 the cheat is reported gone and has been the scene of bad swimmer recirculations. This rapid is best portaged left against the cliff face rather than at water level. Perhaps the largest rapid of the run is Four Deaths. This rapid, named allegedly after Lars Holbeck claimed to see 4 separate places where you could die in it, is long and burly with shallow rock lurking in many places. It finishes with accelerating water down a low angle slab towards a remarkable tubing standing wave feature caused by a right side boulder and then ends abruptly with a large fearsome looking hole. Some people seal launch in on the right running only the second half of the rapid, others ferry right after scouting left and portage the whole affair. A steep trail ascends Bald Rock Dome river right here and could be useful for emergency access/egress. See this website for more details. The confluence with the Fall River (possibly into the lake depending on water level). Upstream lies a spectacular waterfall. As of May 2007, the Milsap Bar gauge is reading 200 to 300 cfs lower then what the river seems to be running, based on good guesses by local boaters. How this will play out through June is unclear. Probably it means that Bald Rock will be runnable later into the summer than the gauge suggests. June boaters, please post your experiences here, so that we can figure this out. Thanks, and happy paddling. 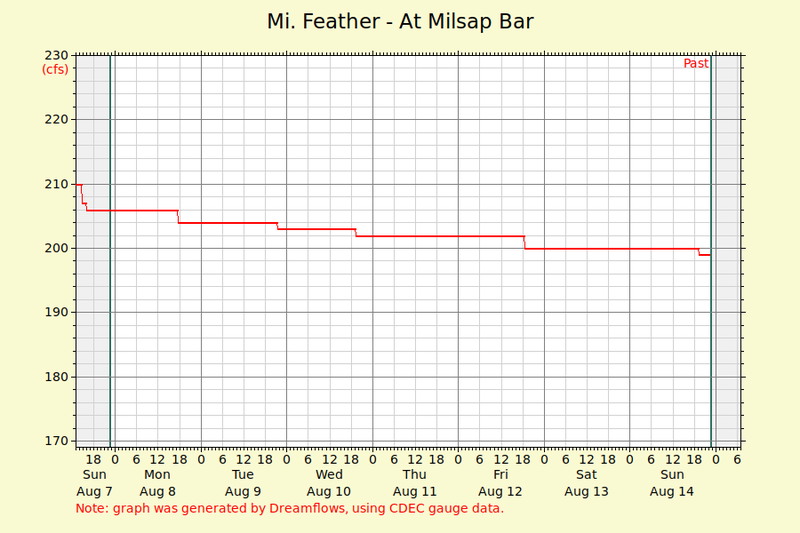 This gauge is located on the Middle Fork Feather at Milsap Bar which is the put-in for this run. It also includes flows from the Little North Fork of the Middle Fork Feather who's confluence is at Milsap. The gauge does not include flows added by the South Branch of the Middle Feather which enters just below putin. Flows are key on this run, the portage at Atom Bomb Falls becomes death defying above a certain flow which is perhaps 1200cfs at current gauge calibration, and certainly most sections of this run would become frightening in high flows. This gauge is also subject to significant annual fluctuations in calibration, if you are not local then ask around if flows are pushing the high end, it will not be possible to bluff your way down this run if you put on big water by mistake. As of spring 2008 several parties reported gauge readings once again had apparently changed since the previous year with parties feeling the gauge undertstated the flows, see dreamflows forums.